A regular contender in recent years and the 2011 MLB champions, the St. Louis Cardinals are also one of the most successful teams in baseball history with 11 titles. 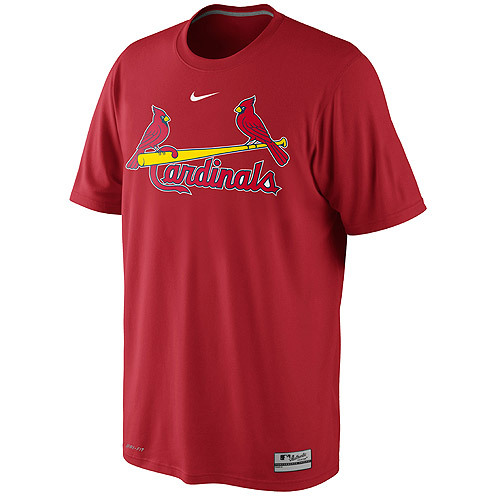 As one of the most popular teams in the league, the Cardinals are an ideal gift option for many fans and collectors. 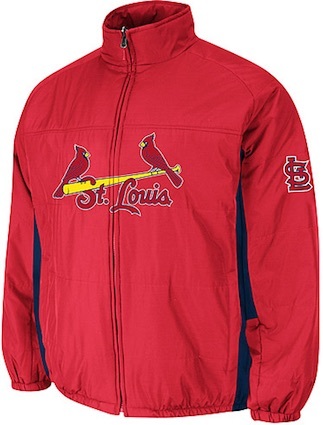 The following guide highlights 20 gifts that are centered around the St. Louis Cardinals. 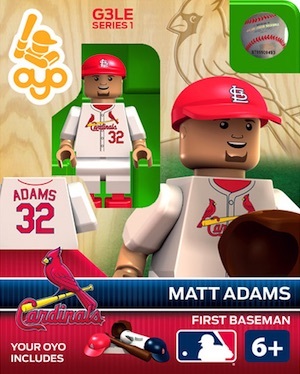 While this guide is focused on gift ideas, Collectors looking for additional information for the team should check out our comprehensive St. Louis Cardinals Collecting Guide. 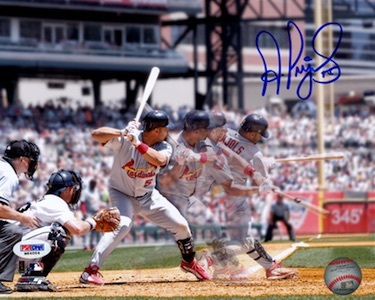 The list below includes 20 gifts across all budgets that are sure to appeal to fans and collectors of the St. Louis Cardinals. 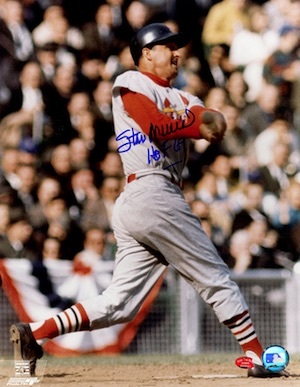 One of the greatest players in MLB history and the greatest Cardinal of all-time, Stan Musial is a baseball legend. His death in 2013 means that signed items are expensive, but autographed photos remain in good supply and are a fantastic gift option. Mark McGwire has seen his stock fall due to the steroid scandal but he is still remembered fondly by fans of the Cardinals. The prolific home run hitter is a fan favorite and a signed baseball makes a great gift option. While he left St. Louis for a big payday and the lure of Los Angeles, Albert Pujols is still one of the great Cardinals of all-time. Signed items are pricey but make a great premium gift option for a fan or collector. A famed pitcher in the team's history, Bob Gibson is a Hall of Fame player and he won two World Series MVP awards with the Cardinals. 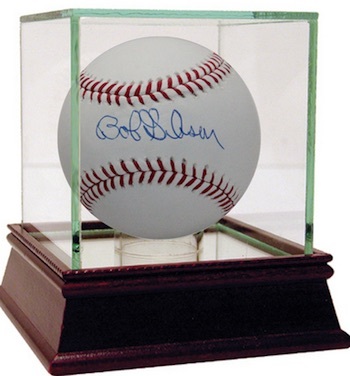 A signed baseball presents a great display option especially when space is an issue. 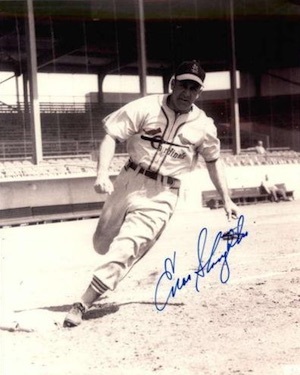 Enos Slaughter played for several team in his career but spent the bulk of it in St. Louis. Despite his death in 2002, signed photos remain a great budget gift option. With 15 All-Star appearances and 13 Gold Glove Awards, Ozzie Smith is one of the most decorated Cardinals of all-time. 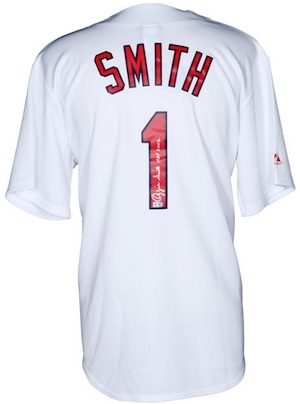 A signed jersey for Smith makes a terrific premium gift option that would be the centerpiece of any man cave. 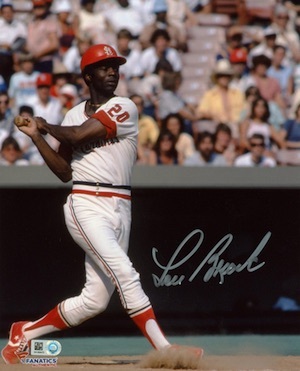 Lou Brock started his Hall of Fame career with the Chicago Cubs but still spent the majority with the Cardinals. He helped the team win two titles in the 1960s and is a popular option for collectors. Signed photos are an appealing gift option and can be found for reasonable amounts. Another player who spent time with many teams, Jim Edmonds was big for the Cardinals and helped the team claim the 2006 title. This signed bat is a great display piece and a awesome gift for a fan or collector. The current stud pitcher for the Cardinals, Adam Wainwright is among the most popular players on the team. This framed collage presents a budget alternative to signed gear and would look great in any setting. View more collages and plaques for the Cardinals here. 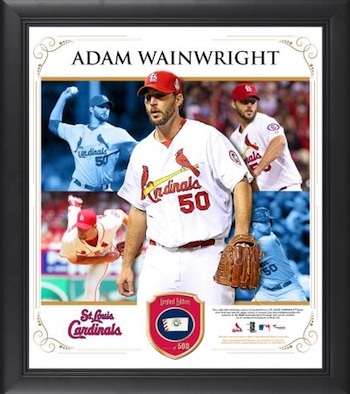 Another gift option that shows that autographs are needed for a nice present, this framed subway sign brings class and style to the Cardinals gift options with team-specific headlines and game-used dirt. 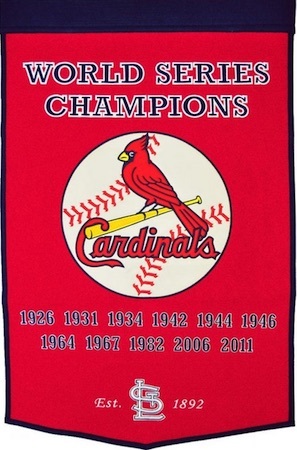 The Cardinals boast a rich history and that is on full display on this wool banner. A large team logo is shown along with the year for each of the 11 World Series wins. 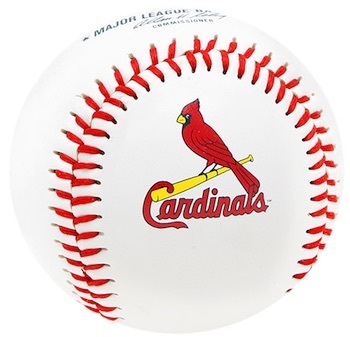 A fun budget gift or stocking stuffer, this team ball for the Cardinals can be played with, used as a display piece, or taken to the ballpark for signatures. Baseball cards are a popular option for fans, but they are not as simple to buy because they are so specific. 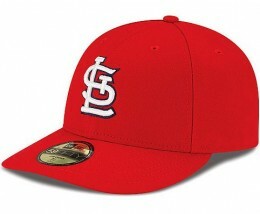 One option we recommend for budget gifts or stocking stuffers is St. Louis Cardinals team sets. Some are sealed and some are hand-collated, but the result is the same. 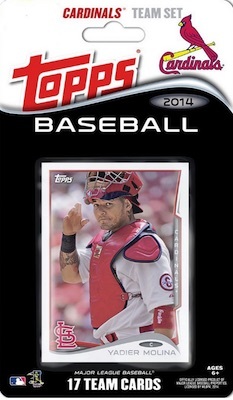 Make sure to verify the year of the card and the players included to make sure you are getting what you expect. Whether shopping for a child or an adult, St. Louis Cardinals figures and bobbleheads can be a great gift. Several different brands offer a variety of options and many players can be found from the history of the franchise. Check out specific figures on eBay and MLB.com using the links below. There are a good variety of different St. Louis Cardinals team fatheads. 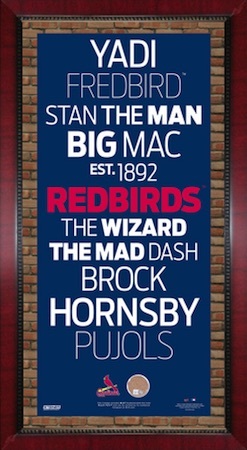 In addition to team logo versions, players are some of the top Fatheads and three of the most popular Cardinals are noted below. 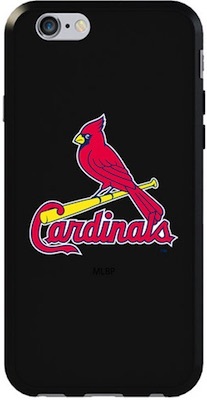 Smartphones are the new norm and can make for an easy and inexpensive gift for a St. Louis Cardinals fan. Just make sure to verify the exact make and model before you buy. We have included direct links to Amazon below for the most popular phone models. 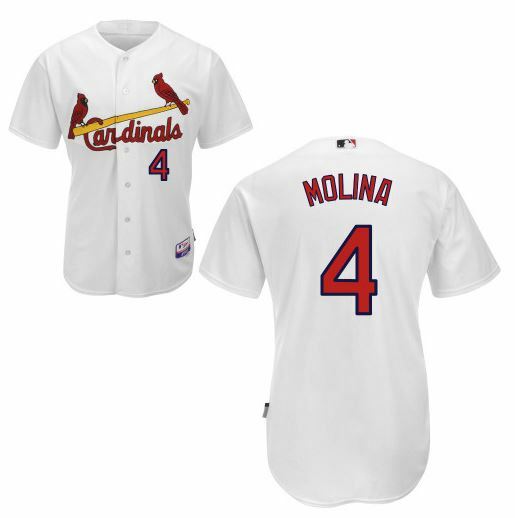 Jerseys remain the most common way for fans to display their love of the St. Louis Cardinals. Replica versions offer cheaper prices and fans can also have them customized for added appeal. If you are overwhelmed by the many versions, check our detailed MLB jersey guide here.